Why Is India Obsessed With Fusion Food? Not too long ago, I was anti-fusion to the core. Okay, not quite. 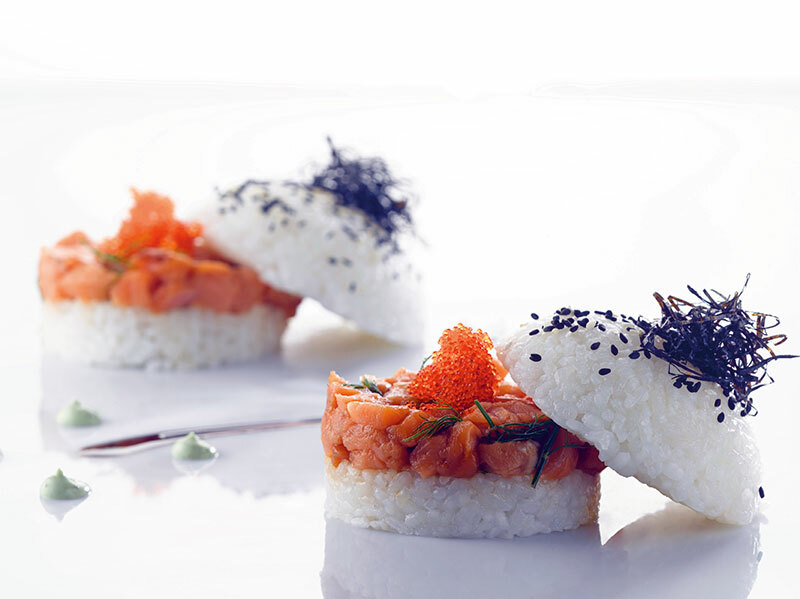 But I was a purist who sought out the most exquisite steak, the fieriest Chettinad cuisine, the ne plus ultra of sushi. I thought of fusion as ‘lego cookery’, a term coined by food historian Felipe Fernández-Armesto to describe an approach that combines components without care. After all, just throwing a bunch of fancy things from different places in a pot does not an inventive (or good) dish make. After choking through a series of poorly conceived, badly executed abominations like birizza, chamosa and lemongrass chicken tikka, the words ‘fusion food’ began to strike terror into my palate. I sought solace in the classics, distancing myself from the trend by sticking to regional cuisines that were distinctly separate and authentic. In its broadest sense, fusion has always been there. We were eating it long before the term was coined or hip (or blacklisted) and long before there was such a thing as butter chicken pizza. Many of the taken-for-granted ‘Indian’ vegetables — potatoes, chillies and tomatoes — are imports that India made its own. My aversion related to the 1990s and 2000s when Indian chefs began combining ‘look at me’ approaches to food that had amounted to culinary crimes. Bad Indian fusion dishes began flooding restaurants and roadside eateries faster than you could say ‘yuck’. Many of these ideas were plain bizarre and so forced, they ought to have been banned. Fusion came to mean the contrived, heavy-handed use of lemongrass and balsamic vinegar by chefs who lacked any real familiarity with such ingredients. The meal that changed my mind about the subject was an unexpectedly delicious dinner I ate at Indian Accent in 2010. It began with a marvellously crispy blue cheese naan, continued with a plate of foie gras stuffed galouti kebabs so delicate it was like biting into spiced air, moved to a plate of drop-dead clever khandvi ravioli and concluded with a stunning mishti doi canoli. I realised that day that while forced culinary marriages are a disaster, reimagining Indian food can actually go down a bomb. The fusion theme’s been on my mind for quite some time. I decide to find out how the F-word is taking shape in India by picking the minds of some of its most deft practitioners and purveyors: Manish Mehrotra (Indian Accent), Manu Chandra (Monkey Bar and The Fatty Bao), Sujan Sarkar (Tasting Lab and Ek Bar), Floyd Cardoz, Thomas Zacharias and Sameer Seth (The Bombay Canteen), Abhijit Saha (Caperberry and Fava), Zorawar Kalra (Masala Library and Pa Pa Ya) and Atul Kochhar (Benaras). Most still cringe at the word. Chandra tells me he has nightmares of a meal he was served a decade ago of chicken tikka mousse with dal makhni sauce and Szechwan chutney. “It was a classic example of people trying way too hard.” He isn’t the only one. Show me one self-respecting chef who openly says, “Yeah, I do fusion.” Instead, the culinary world prefers terms like ‘cross-cultural’, ‘globally inspired’, ‘chef-inspired’, and so on. Though culinary borrowings from other cultures are on the rise, Indian fusion 2.0 is more subtle and intelligent and is coming from the right place — an understanding of ingredients and cuisines. The new wave is dishing up a gutsy mash-up of street fare and haute cuisine, deep-rooted Indian flavours and avant-garde cooking techniques. Prime examples: the now-on-their-way-to-becoming-classics such as the maple and kokum lamb chops from Masala Library, Chandra’s mutton curry from Monkey Bar and the gulab nut from The Bombay Canteen. Those who dare to cross genre lines are deeply aware that the sum, that is the final dish, must be greater than its parts. As Saha says, it is less about gimmickry, more about cleverly assimilating, mastering and revolutionising food traditions. I love that most Indian hybrids today are taking inspiration from India. Take, for instance, the most recent addition to The Bombay Canteen’s menu, the vidishi style baingan bake, which elevates the humble yet delicious Maharashtrian classic bharli vangi by preparing it in the style of an eggplant parmigiana. Or Abhijit Saha’s Kerala vegetable istew espuma, which converts a classic breakfast dish into an appetiser that does not require appam as an accompaniment. The approaches to fusion vary widely. Sarkar employs two different styles at Ek Bar and Tasting Lab. At the former it’s more of a twist to regional Indian food, primarily a cross-culture hybrid of Indian flavours with limited international influence. The chicken tikka sausage, for example, where the flavour and ingredient is the same as chicken tikka but using an in-house sausage-making technique that’s fresh and trendy. At Tasting Lab, he combines both technique and ingredients, most of them sourced pan-India, to make dishes like scallop ceviche with fresh ice apple (taal), mango ginger, soy, puffed black rice and togarashi. 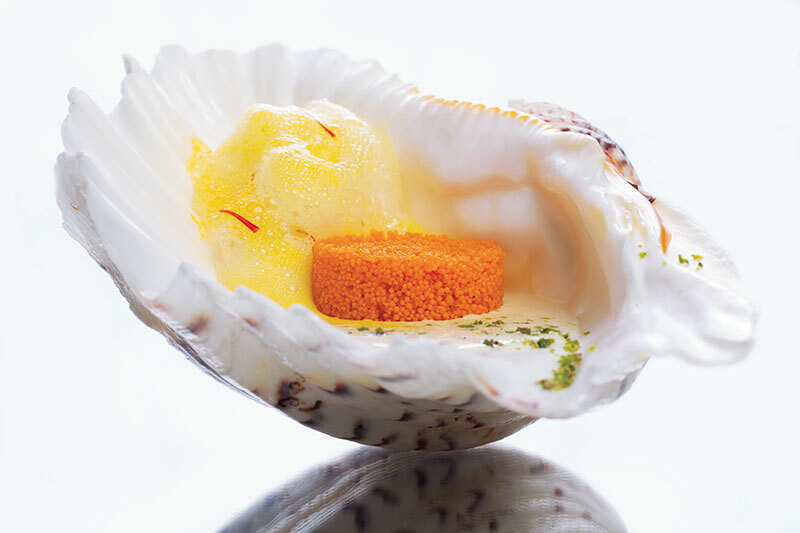 Cutting-edge technology also plays a starring role in dishes like Saha’s gol gappa spherification as well as Masala Library’s classic dessert jalebi caviar. The latter presents jalebi in the form of caviar-shaped pearls. “It’s no mean feat to get the same shape and size of pearls, so we had to get a customised utensil made for the dish to come out perfectly each time,” Kalra says with more than a hint of pride. Again, Ek Bar’s cheekily named Ek Bar-granola bar is a super-crunchy savoury bar made of jhal muri using a French technique and served with home-made dahi bhalla sorbet (made in a Pacojet ice-cream machine) and baby coriander. Kochhar, the genius behind London’s acclaimed Benaras, draws his inspiration from diaspora cooking. The chef who returns to India after 22 years with a new restaurant in Mumbai, NRI, promises to give us a taste of Indian food which has been transported out of India over the decades and taken new form in its new habitat. I can’t wait to get a taste of his roti canai, bunny chow, Johnny roti and Caribbean goat curry. Whatever the approach, there is consensus that good fusion cannot be all novelty and spectacle. Mehrotra likens it to wine pairing: “It either works due to contrast in terms of flavour, texture, temperature aroma and taste; or it complements. The balance in the dish, the science, the technique and the justification behind the fusion is as important as the other factors,” he says. Cardoz, who rocked the world with his wild mushroom upma polenta with kokum and coconut milk in 2011, believes in a ‘soul-based’ rather than a ‘head-based’ approach rooted in the passion for a single cuisine. With such complexity coming into play, fusion can’t remain a dirty word. Zacharias says he has embraced fusion. “At The Bombay Canteen, we are rooted in India. The inspiration for our food and drink does not come from one specific source but from all over. And what is fusion if not using all that inspires us to create something new?” Mehrotra, considered India’s finest chef, refers to fusion as ‘evolution’ while Sarkar calls it “the real revolution in the modern food business”. From confusion to revolution, now that’s a serious comeback. Kalra stresses on the difference between fusion and progressive cuisine. “We use elements of cuisines from other cultures to present Indian and Asian cuisines with a whole new dimension to bring them into the 2020s. It is neither hybrid nor cross-cultural, it is simply progressive,” he argues. Case in point: Masala Library’s dal chawal arancini. The idea of it comes from the Italian arancini, yet it’s an Indian dish with no foreign influences whatsoever. Point taken. The fact remains that while fusion as a term may have become deeply unfashionable, its influence is everywhere. Giving it a bum rap is pointless because it’s inevitable and part of the journey of food. As Chandra admits, even the most basic Indian dish reveals fusion at its core. So if bell peppers are found in paneer tikka, no one gives it a thought. And if processed cheese is used to marinate malai tikka, it’s even considered ‘authentic’. As a serious eater, I continue to have strong feelings on lousy food. But I don’t necessarily hate everything fusion. Cross-cultural mash-ups are a work in progress that will continue to change with each successive generation. Today’s stuff is good, but not as good as what might come later, because it will evolve and there will be new kids in the game, and they’ll be fusing and mashing and their style will be just so fresh. Examples of bad fusion abound. But the very fact that Indian chefs today prefer not to force the food, and just let it evolve, is a breakthrough. I share Seth’s excitement about a time when techniques and cooking styles of Moplah or Odia cuisines are being celebrated in restaurants in new and exciting ways. And Kochhar’s belief that India’s contribution to world cuisine will grow as more and more chefs lean towards spices for flavours and inspiration. To me dishes like the chicken tikka sausage and the gulab nut amount to a dazzling showcasing of the innovations of fusion 2.0 and offer a taste of the future. So what’s next after spherified gol gappas and caviar-inspired jalebi?